Capt Pappy's Blog – Where the Dogs of the Chase Howl! The Boise Think Tank has identified five great areas to look for the blaze. Capt. Pappy will be looking in these same areas but that doesn’t mean he wont miss the secrete. Anyone interested will be given an analysis of the chosen areas as stated in the blogs along with inside info. They will be able to team up as we don’t recommend going on your own and keep the treasure if they find it. We will provide transport to and from search areas of our picking or your own choice. We will provide accommodations and meals through trusted and tried inns, cabins and approved restaurants. We have been know to go 50 miles out of our way to eat the best Elk Burger ever and we have experience with this area going back to Fenn’s childhood. Get fishing in some of the best fisheries in the world when you get a break from the “Chase”. Go on your own if you wish but if you would like to have some inside help and not worry about anything but the hunt and natural beauty we have a plan for you. We will get deals for your stay and add 20% to the overall expense. The hole thing could end up at a cost no more than if you had come on your own but we will be there guiding and helping as you Chase the dream. Be as safe as possible and use our experience to help. Find a hiking partner including Capt. Pappy, his side kick Kendrick and Billybobs if you want us there to give you confidence. You get to West Yellowstone or a town near by and we will do the rest. Including what to take and brief instructions on how to stay safe. Death trap for bears and possibly others if gas should suddenly release in the area just up stream on Cashe Creek Yellowstone. Notice the trees that have been burned by acidic fumes over time. Let us keep you from going where a 79 or 80 year old man would not go. Believe me that is an easy limit to break but it has resulted in some bad experiences. We will be accommodating up to five searchers for our first trip then we will consider a second trip later in the search season. Plan for five days up to six search areas and time to take in other recreational activities. This is your trip you pick where to look and with whom and we will get you there. When you come back everything will be ready from a great meal to a beautiful place to stay. If you want to know more send a comment or email at capt.pappy@hotmail.com. We are in the planning stages so send suggestions and requests so we can make it the best Chase you’ll ever have. Thanks. Oh read all my post to get an idea of what we can do to help you in your search. 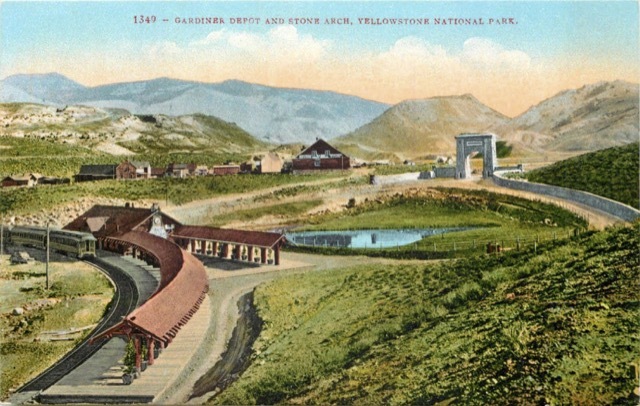 The gate to Yellowstone at Gardiner, Montana has the inscription For the Benefit and Enjoyment of the People. Gardiner Montana was hinted at in the Forrest Fenn book too far to walk. Fenn speaks of a dream he had walking around Gardiner Inland (notice the spelling). Early back in 2011 I spent time looking in this area. I kept looking here for almost four years. Made at least thirty different explorations of the area and I feel it is not in Gardiner nor on the Yellowstone river nor any of the creeks in that area. Yes, Gardiner is a hint but not because it is there. Forrest would not give the area away so easily. From his dream to Devil’s slide or from Brown’s put in to Yankee Jim’s canyon or Joe Meek to the newsman who floated down through the his canyon, they all have merit but no secreted place. So is there a hint in all this yes I believe there is and I am going to share the reason with you. I have come to believe the hints are far more than Fenn would give if it were there. He said the hints in the book are general just to help identify a clue. Not his exact words but if you have studied you will know everything you need to know is in the poem. Devils slide, Gardiner is not in the poem, Brown and meek are and maybe Sphinx Creek. Every place in the Rockies is a possibility so of course it could be around Gardiner I thought so for over three years but now I have found what I feel is the connection. 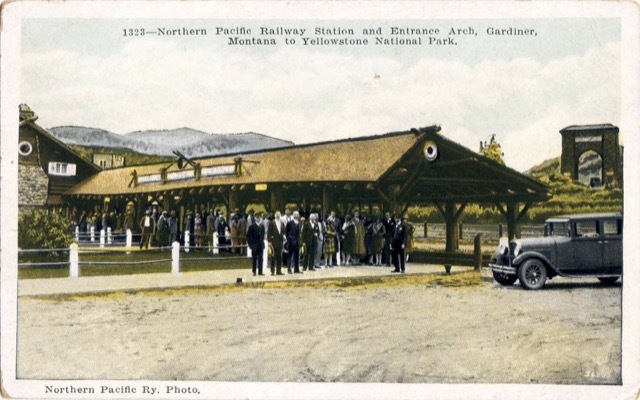 The Northern Pacific was proud to call Gardiner the “original entrance to Yellowstone National Park” and, from 1903 until Union Pacific built to West Yellowstone in 1908, the only one reached by a railroad. These postcards show views in and around Gardiner. 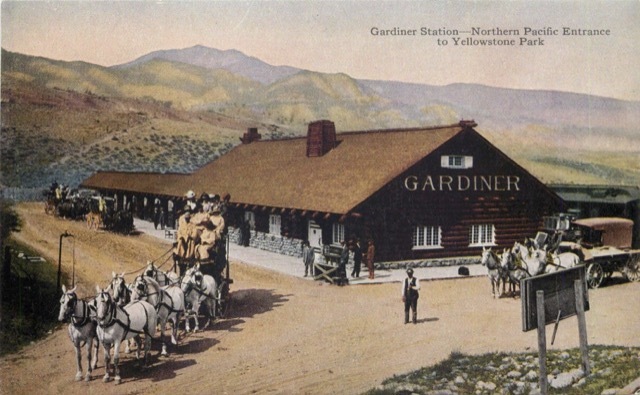 NP’s train station at Gardiner was built on a loop that allowed the train to turn and head back to the main line at Livingston. This card was not issued by the railroad but does present an overview of the town. This card probably dates from before 1915, the first year automobiles were allowed into Yellowstone. The NP logo on the back shows that it was issued by the railroad. Here’s another view of the Yellowstone stagecoach. The fact that the card calls it the “old stagecoach” suggests it may have been issued after 1915 as the transition from stagecoaches to open touring cars wasn’t completed until 1917. No NP logo, but the front says it is based on a photo taken for the NP. The automobile in this photo dates it to around 1930 plus or minus a couple of years. Again, no NP logo but an NP photo. The Northern Pacific printed a very interesting pamphlet about the Walkins Dude Ranch later to be rescued as a national site and renamed Firehole Ranch. Early on after the Gate was built in Gardiner this pamphlet advertised the Ranch as a place of “riches new and old.” Yeap! The Firehole was new and Walkins was the old, the riches were the land, hunting and fishing that the elite of the day enjoyed after arriving at Gardiner via train and then a ride through Yellowstone to end at the Walkins ranch. The hint is not Gardiner nor the park but it is West Yellowstone and Firehole Ranch but before you get too excited it is not at that Ranch but it is tied into the solve in my opinion. The train was the way into the Yellowstone and it went to Gardiner, just before that the tracks ended at Cinnabar where the Devil’s slide can be seen. Devil”s Slide is reddish as it contains mercury which they used to mine gold some of which was Joe Brown’s gold. Gardiner has the most references to things in the book but there is another place it hints at. I believe in a collective conscience and mine tells me the Dogs are all packing up and they will be close enough to each other this next search season to hear each other’s HOWLS. Two things left to say for now, as I have a lot of likes on Facebook which I don’t use often it would be nice to get feedback here at Captpappy.com. I have zero likes. If you don’t like this blog please give me some feedback if you do like please like me, thanks. Finally just to poke at “A Gypsy’s Kiss” I find there site to be very professional and useful but they are not very open as they refused to gather with me or others at the signings et cetera. Oh don’t go to Gardiner until you read my earlier blogs as I wrote a lot on this area including my favorite Elk Burger at the Wild Horse overlooking the Yellowstone. Tell the bar keeper Capt. Pappy sent you. Hebgen Lake just north west of West Yellowstone. On the dock are some of my fishing buddies. We arrive as soon as the ice breaks and the fish are hungry. Not long after this picture was taken we witnessed real drama. A large 20 inch rainbow jumping three feet out of the water fighting for freedom and inadvertently signaling diner to a nearby osprey. Kendrick released the fish but freedom was brief as the osprey splashed the water grasping the trout and flying back to its roost. Suddenly a bald eagle appears screeching while slamming the osprey with talons ripping the rainbow from the unfortunate raptor. Fish flying to the freedom of the lake, eagle and osprey struggle to remain afloat on the brilliant blue sky while a second eagle swoops down catching the prize before it hits the water. What a show as we watched the two eagles fight in the sky over that fish then disappear back to the beautiful forest. Here is an exercise I go through every now and again to gain insight. How many clues do you think I have solved in this reveal. Maybe none will be your answer and that may be helpful as you can eliminate my ideas or add new ones. “Begin it where warm waters halt.” Warm waters are the huge numbers of hot water features found in the Yellowstone National Park. Most of these warm waters run down the Firehole and the Gibbon rivers or the Yellowstone and the Gardner rivers. Of these I pick Madison Junction the place were Firehole and Gibbon meet to form the Madison. Why because the Yellowstone is the only place my inner child says geothermal and Gardiner Montana is no longer on my list. I grew up in New Mexico where we are lucky to have any water at all. If asked, a child in New Mexico knows about the Yellowstone but does a child in West Yellowstone know what warm waters are in New Mexico? Forrest said to ask a child to solve the poem my child knows where warm waters starts is in the Yellowstone National Park. Ask your own inner child and hear the answer then decide for yourself. Not convinced then think about this. Why did Forrest say the last clue I’ll leave is my car parked at the Denver Natural History Museum? Well, For awhile there where few ways to get to the Madison River which runs nearby West Yellowstone Airport. The first airfield in West Yellowstone was built, as was the newer one, in the middle of a large forest. The first real effort to get people to fly into West Yellowstone was a venture between the government and Trans World Airlines (TWA). TWA started a series of flights into the National Parks called (are you ready for this) Wise Owl Airline. Yea if you been wise you may have flown to the West Yellowstone Airport on a Wise Owl Flight. That would land you on top of “the home of Brown”. What does this have to do with Denver you may ask well for a time there where only two places to fly to West Yellowstone from Salt Lake City and you guessed it Denver. For a time Salt Lake was off that short list. So how do you leave your car without giving anything away, park and fly. And yes, I have added some others clues to support where warm waters halt but that info is saved for a trip I hope to have for fellows Dogs. “And take it down not far but too far to walk” about ten miles down the Madison River from Madison Junction by crows flight is Baker’s Hole also known as Browns hole the place Fenn loved to fish. But if one Brown is not enough down from warm waters halt how about three. The airport is there and it was built on a dump famous for drawing lots and lots of bears. Tourist came often to watch the bears. That’s two and here is the third in the same immediate area Camp Brown built in 1905. That’s as brownish as anyone will ever get. Three Browns in that one place. “Water high and heavy loads” refer to one fishing and one flying term. Water high on you waders is a way of saying deep. He threw a bike into water high he said. All fly fishers know if water fills your waders it could result in drowning. Water high on your waiters should give you some cause for caution “not for the meek.” Loads refer to fluid and gas dynamics it would mean a heavy current which is why you can’t paddle up it. The wings of an aircraft experience heavy loads also but that is not a hint. “The end is ever drawing neigh” is the end of your creek and that creek is coming in on the left. Ok how many clues do you think I have gotten. I do this to help both those in the chase and my followers find the treasure. No not all I think is here I do have more as from here I am still a long ways from solving his Poem. I am also setting up a few trips were I would take a small number of searchers to places they think would be the best of five good possibilities. Remember if it was easy it would be gone by now. Last word I have just started making some money to pay for this site. Eight years ago I gave two books away for auctions a long with notes and a map and the money was for a non-profit but now I need to make a little as every penny counts so pardon the few adds you may see. Also likes help as do your much appreciated comments. So please like me or tell me what you don’t like. Also lets share knowledge so this site stays relevant. P.S. Can the blaze be man made? The treasure is not in a place related to any man made thing but how about the Blaze. What do you think. I got lots more but it is the readers turn. Comment! There are maps out there claiming to show where Forrest Fenn’s Treasure hides. Be careful, ask why anyone would show others where a million and a half dollars are waiting. No one but Forrest could do such a thing and he choose a poem not a map. Well yes there is a map it is on the cover insert of his book released after The Thrill of The Chase, however good luck with that one. I am developing a map that will be backed up and follows the treasure poem. This map will be used to setup some searches by whom ever wants to be a “Dog of the Chase” with the backing of the Boise Think Tank and Capt. Pappy’s notes from all 9 years. If the chest is found out of the range covered by this new map you get your money back! This map is in one state and only a small area large enough to contain all the hints in the poem. logic and imagination both play in these solves. Here is an example of this thinking. Give a child the poem and let them decipher it. OK, where does warm waters halt. First lets ask where are warm waters. Could children come up with some obscure place? Where would Forrest guess when he was a child. Where does the child in me think warm waters halt? Come on you knew your inner child knows. There you go warm waters halt here and go to where the Pacific Railroad says it is Riches New and Old. Also it is suggesting Montana. How about the last Mahican emblazoned with the famous Turtle, Fenn thought a lot about that book. Is this the blaze at the Home of Brown. There is one new place to look where I have not been but plan to take others who wish to join the Chase. Writing something new gets harder each time . Readers deserve to get something new to add to their own search and the only way that happens is when I learn a new perspective. Synchronicity is again rising up through the minds of those who wish to find the end of the rainbow. Again at the end of the season I get a new and better area to concentrate on. This time as before I am leaving it up to the “Dogs of the Chase” to fill in the blanks. If Forrest likes my blog he has never said so but I believe he reads this occasionally just out of interest or perhaps to have a laugh. I was closest to Fenn’s treasure when I was searching in Gardiner but I was closest when I wasn’t looking but fishing for Browns. I am giving a few clues but I am in a true race as many are beginning to gravitate to the secret location. This has been going on for several years but just as Forrest said everyone goes passed the last few clues. Why because it is very tricky as he made it harder to find. If you know where to begin you are half way there. Half way is a long ways and so is the second half of the way. Finding the home of brown is also a long ways from the secret place. Here’s new info that my now ninth year of experience has brought me to believe. Here is a list of places the treasure is not wanting. Let Forrest disagree if he wishes but I will give a few reasons to support my decisions and leave it to the “Pack” to discern the validity. It is not in or around Gardiner Montana. The best shot in that area is Spinx Creek and Yankee Jim’s Canyon below the Brown put in. Years of searching by many searchers has turned up empty. Key wording in poem Warm waters halt but boiling river is where one warm water halts. no one has found a blaze. It is not in Yellowstone Park. 1. Forrest doesn’t like the government ever since his Vet Nam experience. Giving the Park any chance of confiscating his treasure would be untenable for Forrest or the Dogs. It is not in New Mexico. 1. Growing up in New Mexico gave me many camping, hunting and fishing experiences. New Mexico is the “Land of Enchantment” but for a Texan it is no Cody, Gardiner or Yellowstone. With the long drought it almost has no river not a river running through it. He wasn’t going to Denver just to come back to New Mexico. There is a lot of history between New Mexico and Texas. It is not in Lander Wyoming or Sinks Canyon. 1. Warm water halts is not correct it is warm waters halt. It is not in Colorado. 1. Best hint is the car in the parking lot of the Denver Natural History Museum. Great hint but not in Colorado. This is a Key to the correct destination and how he planned to hide the treasure. 2. Is Colorado in the book? Nope! Is it in the poem? Nope. Here are the two of the best clues I can give for now. Use the book The Thrill of the Chase and the poem. If your idea is not in the book or poem move on. Not in the book, move on. not in the poem move on. The Boise Think Tank is on top of the Chase and the dogs are more active than ever. I use to be a little ahead of the pack but for medical reasons I am falling behind. It is a hard place to be in for the guy who has gone looking at the drop of a hat. First, as I remind everyone this is a chase and the first to the treasure wins. Nothing will make up for being first. I figured out a new search spot just a week from neck surgery. I was afraid my days looking in the wood was ending. Now four weeks later I am a month away from driving and a season away from looking. Members of the Think Tank went on a recon last week. I was very conflicted between wishing them success and hoping I would get another chance at being first. The hardest part is knowing how much we give away to each other. Gold changes everyone. If you say to yourself it wont change my ideas you are unconscious to your own behaviors. I am 69 with more 40 years of studding human behavior money changes everything. At the beginning of every search I try to get an agreement as to how we would divide the treasure and how we would handle the press etc. No one knows those answers and wrongly they want to work on that after they find the treasure. Of coarse they do that is human nature. So human nature is to put it off and human nature is to have trouble after the treasure is found. Ever had a death in the family with a sizable inheritance? Need I go on. Look if you think every body is going a long with your idea of fair you have very little wisdom. People steal other’s ideas and believe they were their own. How many times have you told someone your idea only to have them think they came up with it themselves. I have gotten over 90% of my ideas from reading the blogs of others. The original ideas that are mine are never seen by others until I back them up. Every time new insight is developed everyone who hears it thinks its too easy even if it took eight years for me to come up with it. I have had tons of help but when I find the treasure believe me I’ll be patting myself on the back but deep inside I will know I used others to get wherever I go. That said the “Tank” is close and the alpha dogs will not be found on the porch. One last season then I spill the beans sending the the dogs after the “fox’s” secret. Woof woof. Book signing in Sante Fe with Forrest and his good friend Douglas Preston gave me a few things to ponder. Mostly I asked myself how Douglas Preston could know that Forrest put clues in his new book. Forrest’s grandson asked the audience to hold any questions about his treasure as his grandfather wanted the book to sell on it’s own merit. later Douglas chimed in with a statement that there are clues in the new book. Does anyone else get the uneasy idea that Mr. Preston has special privy to information the rest of us do not know about? I can’t stop asking how would Preston know if there are any clues if one, he did not tell anyone there were clues in the book and two, how would Preston recognize a clue in the book if he has no idea of where this chest is hidden. This is exactly the kind of things I focus on and the reason I came to the book signing. After much thought, I have narrowed the possible clues Preston refers to as the statement Fen made about parking in Denver and a much less obvious clue, when Fenn might of hid the chest. For me, any other clues Mr. Preston might be hinting at would be impossible without suspension. As for the event it was wonderful. My brother and I were speaking to some providers at the rear entrance of the book store when to our great pleasure Mr Forrest Fenn himself arrived. We were lucky not to be in the line at the front of the book store but to have a brief discussion with Forrest in the back. Forrest gains more of my respect every time I see him. Three times I have been at signing and Forrest has been very approachable every time. He is very witty and has a treasure trove of stories about the people he has known and the places he has been. I have no doubt Forrest hid a treasure. I have a life time experience with New Mexico and Sante Fe as well and they live up to their reputation of high snobbery. The kindest people and most approachable were from out of town. I met and talk to four or five from as far away places as Canada, New York and Montana. I could tell the new searchers from the old by their willingness to discuss their search sites. Seems new searchers are overly concern about giving away a clue but the older ones know their ideas are really safe as no one searcher believes the other has it right. I have told others exactly where I thought the treasure is without any fear that they would rush off to beat me to the treasure. It is a weird bias that I share with so many other searcher. Just think about the many stories you heard but didn’t believe. There was a get together before the signing I missed it but some decided to meet at a near by hotel-restaurant-bar after the signing. I met a lady searcher from New York and we shared tells of our searches. She and her husband went in many of the same areas as I had and to my amazement she had ran across the same poacher I had met in my search. I wrote about him and his son in earlier accounts back in 2013 when we searched Sphinx creek. What a small world. I tried to include others by offering to put our tables together but there clique wouldn’t have it. Ah Sante Fe. Anyway after a wonderful chat I introduce our guest from New York to the golden people to help broaden her social experience and my brother and I left for Albuquerque. Deer Creek was the last place I looked as I shared in a blog before. I plan to leave some pictures here for your pleasure and to give you an idea of were not to go. However the videos and photos don’t want to cooperate so they will come latter. Here is what I took away from my last trip to New Mexico. His last clue is a parked car at a museum in Denver. New Mexico is not looking like the place he chose to hid the treasure. He says he was afraid that someone would check car or truck rental records if they knew the year he hid the treasure. This means he got where he was going without a car. He left his car in Colorado. He did not drive to the hiding place in his own vehicle. I don’t think he walked or took a train or bus but I believe he flew. Would he park in Colorado just to fly back to New Mexico? Would he give Colorado as a clue to rule out other states? I think his family went through Denver every year on their way to West Gate and this is the direction in which he went to hide the treasure. I also believe he cashed his treasure like the Native Americans had done before him. This cashing will probable make the finding of the treasure nearly impossible to find even if you should be lucky enough to get yourself neigh. Final thought the blaze cannot be seen by google and it does not face in any one direction. Figure out how that can be and you’ll have a jump on the rest of the dogs in the chase. In keeping with the intent of this blog I will give the readers some new things to ponder. First let me say in my defense that much of the info and even pictures have been reproduced in other blogs. To back up what I am saying go back 6 or 7 years on this blog to read what is now shared with many other sites. I say good it is just what I wanted but I must confess that after 51 posts and almost 7 years of searching to hear how others blogs are consulted and regarded as expert I get offended. My how my ego pokes at me. I am looking forward to a new podcast where the Boise think tank will discuss information hidden in comments made over the years by Forrest that may lead to new clues. Here is a taste of what it will have to offer. Forrest says to a lady in the book signing in Sante Fe several years ago when she asked if he would take her to the treasure and he answers without filtering sure does she have a plan? Add to this that the last hint will be his parked car in Denver with the statement Forrest gave about someone checking car or truck rentals on the year he hid the treasure and we have plenty to go on. He must of hid the treasure in New Mexico right? Sure he drives to Denver to rent a car to take back to New Mexico. This is going to be obvious when we see the miles driven in the rented car or truck so he must hide the time the treasure was hidden. Let me get my tongue out of my cheek. Rented a car or truck, ah hum, car or truck. He hopes a Texas man with a big family drives up in his truck and walks right to the treasure. Rents an automobile would not be a hint but car or truck that is a hint. From the place that warm waters halt to the home of Brown takes a truck! From Denver to where he rented a truck takes a plane or why didn’t he just drive to the rental. The big deal to me is that the time he went has been narrowed by this new book and for me you can through out New Mexico as a possible state. Finally if it was in Colorado would he leave his last clue in Denver. Why didn’t he leave the car at the rental place? What is the reason to drive there if he lets everyone know he parked there. What hint or hints have you found in the book that the treasure is near Denver? Denver is six hours from Sante Fe. No airline would transport the treasure without knowledge of it. A privet aircraft and a truck are needed to finish the hiding if he flew. Here in lies the answer to where he went to hide the chest. This is the kind of things we will discuss on the up coming podcast. Keep on running you dogs of the chase and may good luck and a large can of bear spray be with you. As for me I now carried a Judge.